How an external challenge gave Aeroscena® a new perspective on cancer patient experience. Several years ago, we were introduced to Havas Health, an innovative health and wellness marketing agency in NYC, via our friend Dr. Michael Roizen, the Chief Wellness Officer of the Cleveland Clinic. Havas was managing an “open innovation” challenge for Pfizer, who sought to provide care solutions for cancer patients. Havas became intrigued by our ability to provide individualized aromatherapy protocols for patients with our personal inhalers, and they suggested we enter a competition they were managing for a Pfizer. The focus of the competition was on finding innovative, digital solutions for managing metastatic breast cancer (MBC). It’s important to note here that Aeroscena® is still in many ways an early-stage company, so when we first heard the idea, we were not completely on board. After all, we are not a “tech” company, and this seemed like a wildcard idea, at best; we are focused on the development of bio-pharmaceuticals, primarily for symptomatic management of conditions like PONV, anxiety, morning sickness and insomnia — not digital innovation. But as we thought it through, we realized that the very symptoms we were helping patients alleviate in isolation could be used together as a comfort care protocol for those undergoing cancer treatment. With that in mind, we began Googling like mad, immersing ourselves in research around cancer treatment and its side effects. We also asked our amazing Cleveland Clinic Innovation neighbors for their input. Inevitably, there were line charts created — unfortunately, with an obvious endpoint. If you know only one thing about metastatic breast cancer, it’s probably that it has a very high mortality rate; only about 22% of patients survive for 5 years post-diagnosis. So, for MBC patients, in particular, there is only one reason you come to an “end-point” on a linear “map,” and it’s not positive. 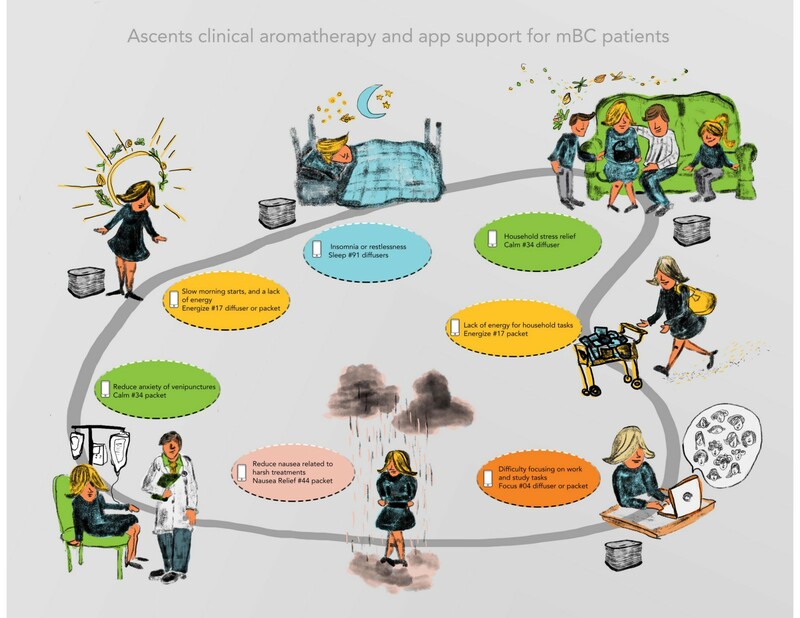 If the idea was a comfort kit to help MBC patients manage the side effects of both the disease and the treatment, we would need to take a more holistic view of the patient’s real life. Rather than viewing the cycle through the lens of disease, we needed to instead view it through a lens of the actual day-to-day life they were continuing to live to the very best of their ability, with the most quality, given the time they had left. Thus, we ignored the conventional, enlisting the help of award-winning illustrator Suzanne McGinness to help us visually explain our idea. This is ultimately how our journey map, A Day in the Life of a Cancer Patient, was born. We would be lying if we said we won the competition. In truth, we weren’t even close, because the competition was technology focused (and we ultimately fulfilled that part of the requirement by planning to create a mobile app “companion” to the journey map to track symptom severity and treatment relief). However, the project helped us gain clarity regarding our solutions as a daily source of support and how they might help patients more easily manage their symptoms in order to not just “get through their day,” but to continue to make the most of their, and their families’, lives. We are happy to report that, as a result of this exercise, we were able to introduce our protocol to cancer centers around the country which are now beginning to adopt our Ascents® aromatherapy inhalers as part of a comfort-care regimen. Although we may have gotten to this point via unconventional means, knowing that we are enhancing the quality of life of cancer patients makes the time invested feel extremely well spent.